You may have noticed that Fabric Mart has a *HUGE* selection of silk taffeta right now. A lot of it is either large plaid or large stripes. I was curious about it, and not really sure what I could make with it, but I just knew it would be gorgeous fabric and had to play around with it. Turns out, it's actually great for quite a range of projects! The dress above is my third project. Let me show you the first two. 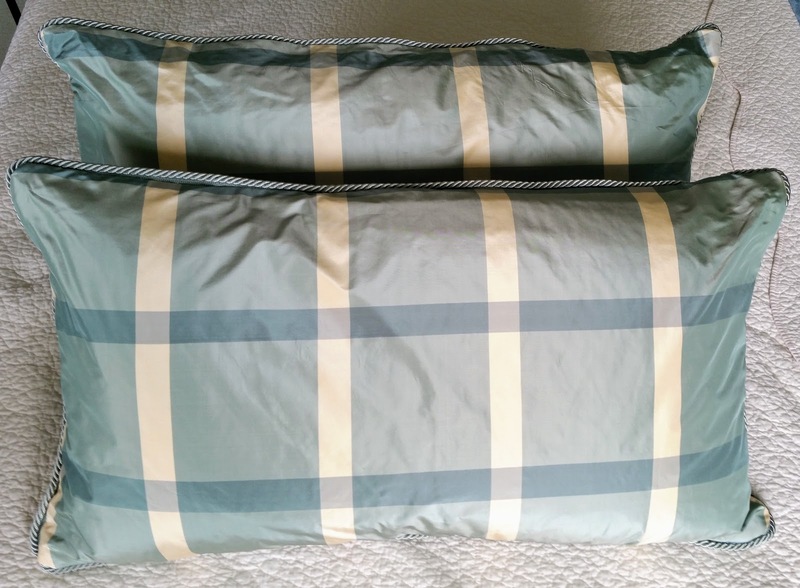 My first was to make some queen size pillow shams. They are the plaid ones in the back of the photo. I also made the two printed ones in the center from another Fabric Mart home dec fabric special! I wanted to make the covers removable with a zipper, and include a braided trim. As luck would have it, I found a whole card of braided trim at an estate sale that worked with my taffeta for just $2! 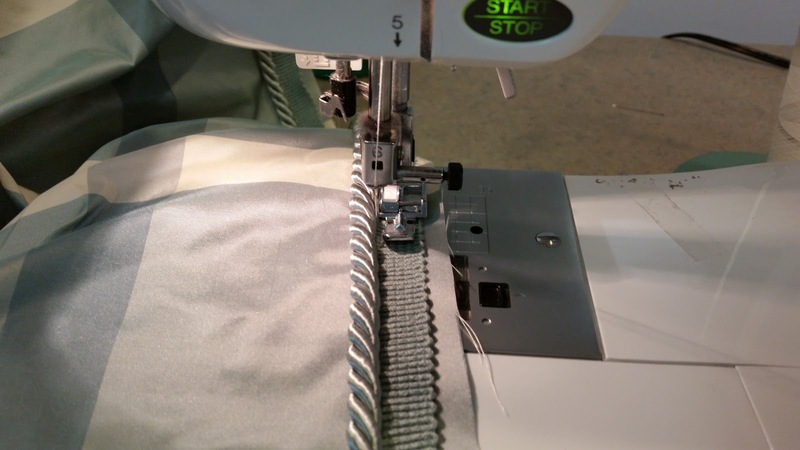 To start, I used a zipper foot to stitch down the braided trim all around one side of the pillow. Then I serged a piece of lining fabric to the back of each side. 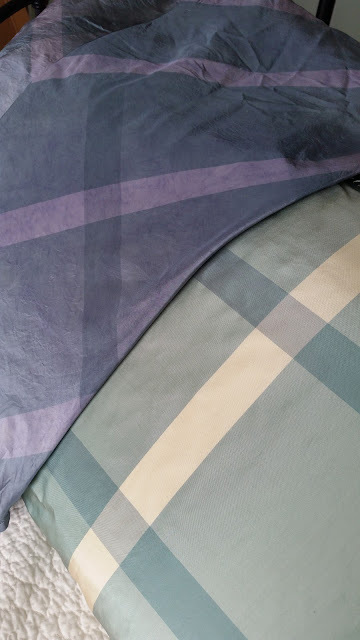 I don't think that you would have to line these, but I'm using down feather pillows, so I thought that the lining might be a barrier to feathers poking out. 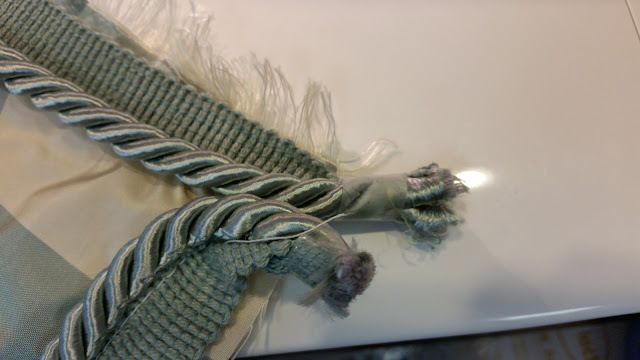 Then, I went back and sewed the zipper face down over the braided trim, as if it would be an invisible zipper. This is what it looked like before I sewed them together. 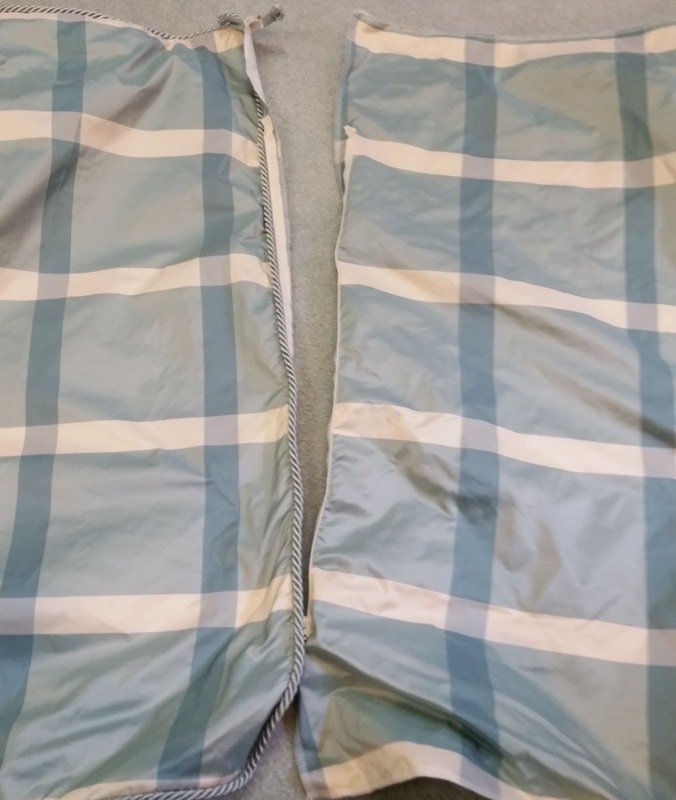 And this is the zipper afterwards-you can just barely see it under the trim. 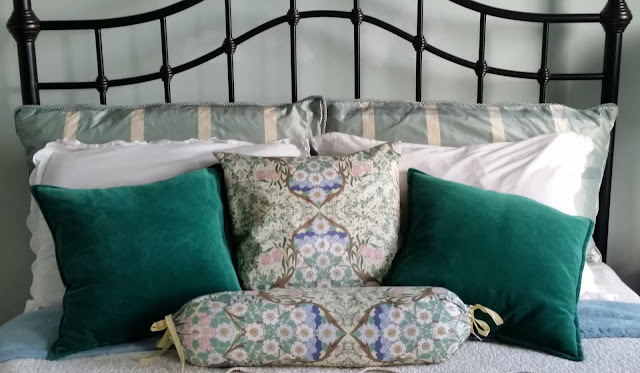 It's hard to capture the sheen on these pillows, but they are really quite beautiful and rich-looking in person! 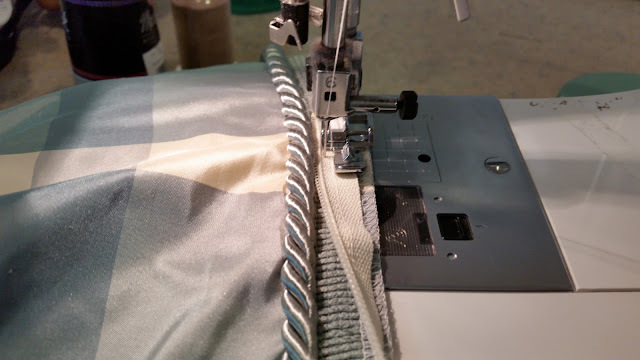 I used 2-1/4 yards of the silk, and I lined them with 2-1/4 yards of drapery lining. I had about a 12" wide piece of silk left from cutting the pillows, so I decided to make a table runner for our foyer table from it. 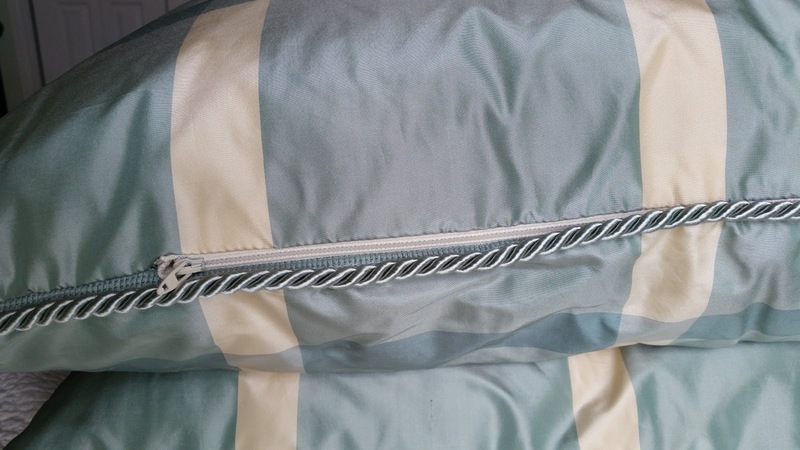 On the back side, I used the drapery lining, and did a similar thing with the braided trim. I think that the braided trim really is a simple way to make things look high end. 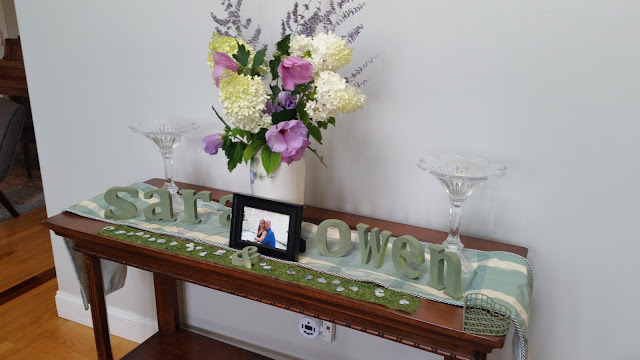 I finished it just in time for a bridal shower that we were hosting, and another great coincidence- the letters of their names were painted in the same shade of green! The texture became a little limper, and slightly less shiny, but I definitely prefer it for less formal clothes. It's been a million degrees here with unspeakable humidity, so I decided to make a loose-fitting sleeveless dress that I could wear for the bridal shower. I found a simple a-line dress pattern with center front and back seams, so that I could cut it on the bias and match the plaid design. I had a one yard package of lavender beaded trim that I used to accent the pockets and neckline, and used a self bias strip turned to the outside to finish the neck. Even though it's simple, this was a technically challenging project to get everything to line up just so! I got a lot of compliments on it at the shower, and one very nice surprise, was that it didn't wrinkle much at all! These photos were taken after a very long day, setting up and then hosting the shower, and then even a nap afterwards, and there are really no more creases than there were to begin with! The crinkly texture was there all along. Sewing with silk taffeta is really easy- it presses well and it doesn't slip around when cutting or sewing like some silks do. 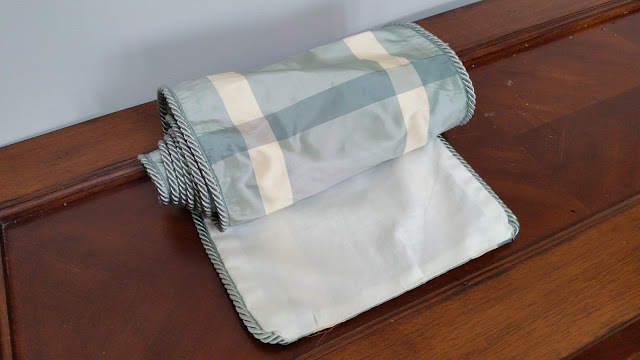 Have you tried sewing with silk taffeta? If yes, what did you make? The pillows and runner are beautiful! A great addition to your home! And your dress is perfect! Is it NL 6430? If so, I've just made 3 of them and love that pattern. So if course you couldn't go wrong using it with the silk taffeta...and now you've got me thinking that I need one more from a washed taffeta silk. Thanks, Carolyn! Yes, I think you need one more too! I used Kwik Sew 3049 for this one. It's long out of print, but a great one for a bias dress. Thanks,g! I agree, if you can find the right trim, it can really elevate a project. I definitely need to try my hand at those pillows and that table runner. Just beautiful. Thank you for sharing. I love that dress! I especially like the way you matched the plaid to form the smaller squared down the center, it really sets off the larger squares of the fabric. I searched for this fabric from the moment I saw your dress, or something in the same size range in a very even plaid, but alas, I couldn't find anything.....until I looked in the sale section and bought the last piece! Yay! I'll make it without dying it although I love the color yours became. 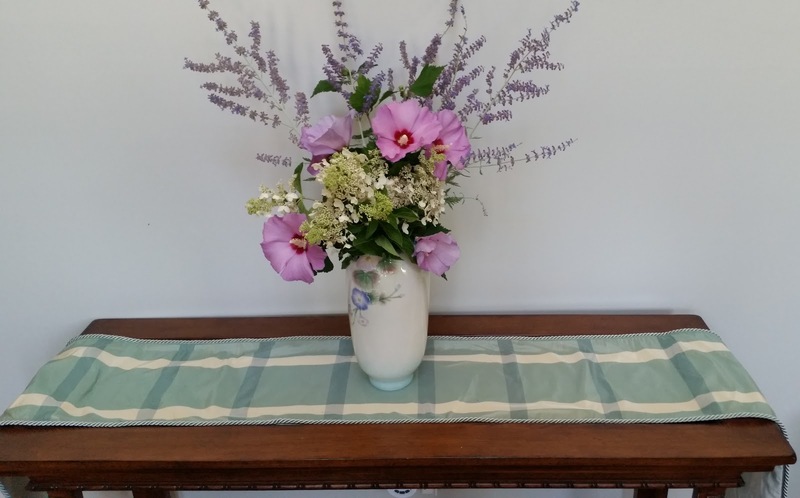 But I like the original color, too, and won't be competing with a table runner! Thanks, freemotion! Glad to hear that you got the last piece and hope your dress turns out great!